We all seem to have that one random pasta recipe that never fails us. It seems to have been created on a night when we are tired, over it, and just want to throw something together that will be good and satisfying. Specifically on the days where we are “over it,” we want something comforting to help us recover from the busy or bad day that we had. All we want to do is snap our fingers and have the ideal meal in front of us with the occasional glass of wine…but we don’t want to work hours on it. What I love about this pasta is how creamy it is but has no Vegan cheese in it. Nutritional Yeast is a pretty amazing thing and I love it so much. If you have yet to try nutritional yeast, or have never heard of it…Go get some NOW! It is high in b12 and b6, as well as it being a complete protein. It is savory and has a cheesy flavor. I have to admit it took a few tries for me to like nooch, but now I cannot live without it! I put it on pasta, pizza, toast, rice…literally everything. Another great way to vamp up your pasta recipe is by adding some veggies and beans! 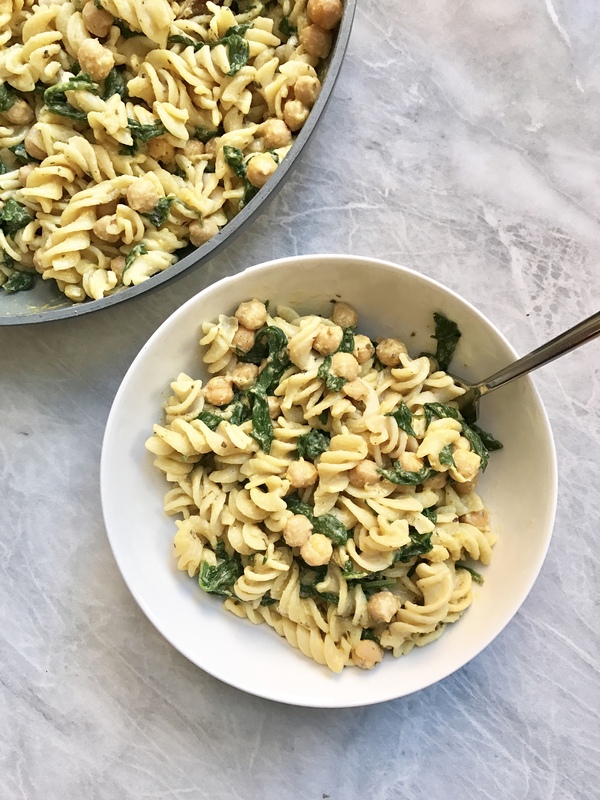 I love chickpeas and spinach but you could totally match it to your preference. I hope you enjoy this easy pasta recipe. If you ever make any of my recipes, don’t forget to tag on Instagram @plantbasedjane so I can see! Bring a large pot of water (salted) to a boil. Cook pasta according to package instructions. 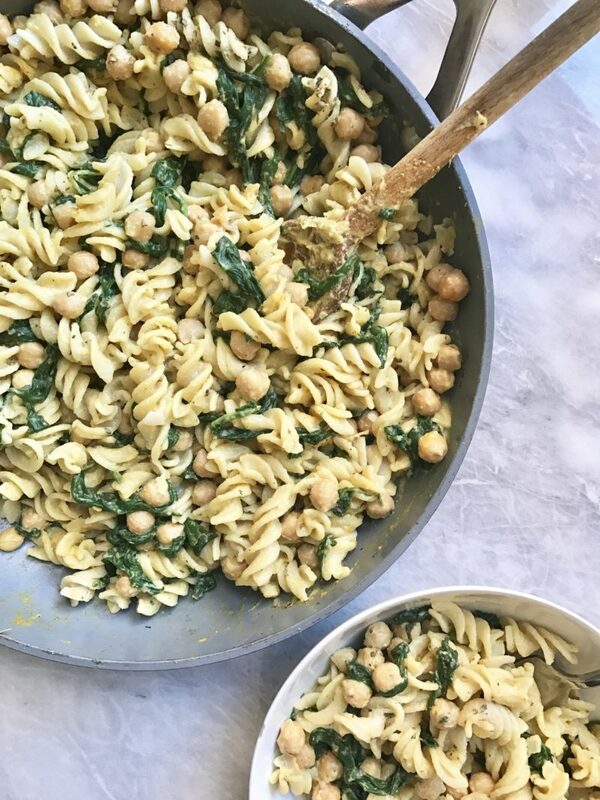 Drain your chickpeas and wash spinach if not using packaged. 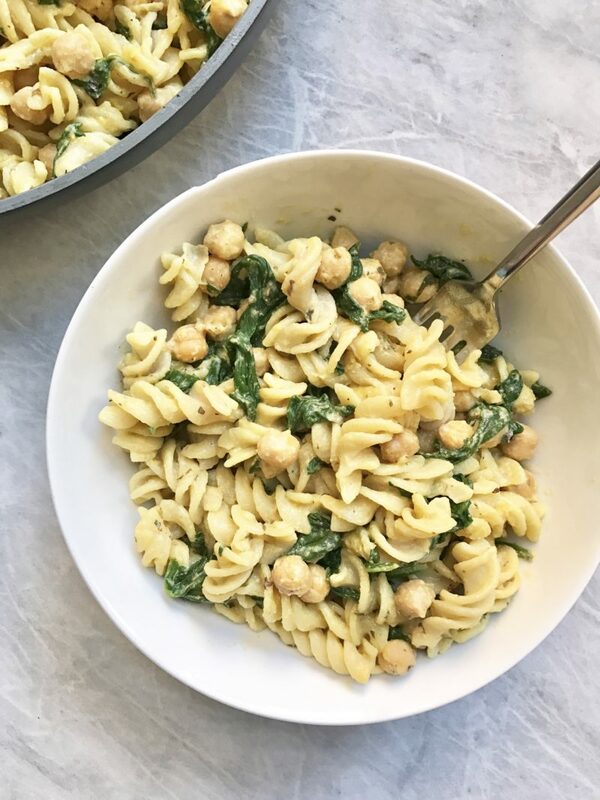 As the pasta is cooking, sauté up your spinach & chickpeas. In a large sauté pan, cook up your spinach and chickpeas with garlic powder until spinach is wilted. This also helps your chickpeas soften up a little. Remove from heat. When pasta is done, transfer it to your sauté pan and all the rest of your ingredients. Stir to combine and serve! I love this pasta. It’s so easy and simple to make. It’s delicious! The first 2 times I made it, I was out of lemon and didn’t use it. It was sooo goood. Then the third time I made it I had lemon and used it. I disappointed because I was expecting it to taste better with the ingredient I didn’t have, but it ruined it (in my opinion). I prefer it without the lemon. So if your not loving this recipe, try it without lemon. Also, it tastes great with siracha on top.